Cheese bread! cheesy bread! I went nuts when I saw this recipe was coming up for FFWD. Who the heck wouldn’t want to eat cheesy, onioney (is that a word?) homemade bread? I wanted to eat it so much that I made a whole big loaf, instead of a mini or half-loaf. We had some the day it was baked with homemade tomato soup– so good!– and some went into the freezer, because it will be awesome alongside scrambled eggs for a weekend breakfast. If you shy away from making bread at home, or fear yeast, or whatever, don’t worry here. This is a quick bread, much like a muffin. In fact, you can even turn the loaf into cheese muffins, if you are so inclined. The original recipe uses chives, but I didn’t have any and used scallions instead. A combo of cheddar and Gruyère was just right, and made this a great, easy, cheesy bread that I’ll bake again and again. For the recipe, see Around my French Table by Dorie Greenspan (it’s also on The Washington Post’s site). Don’t forget to check out my fellow francophiles’ posts! Lovely picture. Cheese & bread are two of my favorite things. How nice of Dorie to make them friends! Ooh! 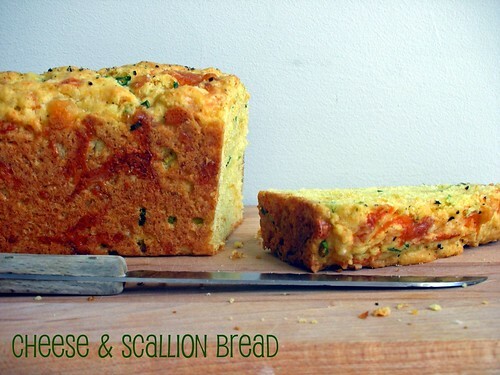 I bet the scallions tasted so great in your bread. I also used a combo of cheddar and Gruyère. Great post! Like you, I didn’t have chives, but I did have scallions, so I used those instead, with some parsley. I liked the end result. Yours looks good too. type of cheese. It’s nice to experiment. Your bread turned out lovely- what a photo ! Nana and I had the same reaction when we read the recipe title – like “how could this possibly not work” ? What was a real surprise is how easy it was. A true pleasant surprise. And countless variations for more playing (and leftover using…. )- great post. Your photo of the bread makes it look so appetizing and lovely colours – I am definitely going to try this and I have some tomato soup in the freezer to accompany it too! Your bread looks like it turned out totally FAB girl. The photo of your bread is so pretty. I put some of mine in the freezer and plan to make some tomato soup to serve it with. Can’t wait to have it again. Oh wow this looks different, I bet the addition of the scallions in it made it really tasty! Going to get to this one someday soon…and no matter what I do, it will never look as great as this one you did…I think you have achieved absolute perfection. This was good. Scallions would be a great sub in this. I was thinking garlic would be good too. Okay, now I’ve made this bread – used finely chopped red onion and diced red peppers instead of chives/scallions and sprinkled some cheddar on top. It is so easy and turned out really well. And yes, I had it with homemade tomato soup. I squirrelled away the last two slices and had them this morning toasted with butter – yum. I think even sunflower seeds or toasted sunflower seeds, would also be a nice addition. Glad you made it. Yes, this is a good candidate for lots of add-in possibilities.